The live coverage of this story has ended for the day. Please refer to CNN.com for the latest news and coverage. Cecil and David Rosenthal, the brothers killed in the Pittsburgh shooting, were members of ACHIEVA, a center in Pittsburgh for the disabled, and were recipients of the center's residential and employment services. “Cecil’s laugh was infectious. David was so kind and had such a gentle spirit," said Chris Schopf, ACHIEVA’s Vice President of Residential Support. Brothers David Rosenthal (left) and Cecil Rosenthal were killed in the shooting on Saturday. Elderly couple killed in shooting were "loving and giving and kind"
Bernice and Sylvan Simon, the elderly married couple killed on Saturday, were “kind, generous and good-hearted individuals,” their neighbor Jo Stepaniak said. Bernice, 84, and Sylvan, 86, were from Wilkinsburg and had lived next door to Stepaniak for close to 40 years. They were the “sweetest people you could imagine," Stepaniak said. “They wanted to give back to people and be kind. They always tried to look on the good side and help out in the community, here and in the Jewish community. They were loving and giving and kind, gracious and dignified,” she said. Jerry Rabinowitz, a 66-year-old victim of the synagogue shooting, was a primary care physician in Pittsburgh for many years. "He was a kind, joyful man. I always enjoyed sharing patients with him because he liked to teach and did it with a smile," said Dr. Adam Rothschild, who worked with Rabinowitz during his residency. "We were both active in our synagogues and we always had a lot to talk about." Rabinowitz's nephew, Avishai Ostrin, posted a tribute to his uncle on Facebook and focused on his smile and his fondness for bowties. "He always wore a bowtie. There is just something about guys who wear bowties. Something youthful, something fun. And that is a word that definitely embodied my Uncle Jerry – fun. You know how they say there are people who just lighten up a room? You know that cliché about people whose laugh is infectious? That was Uncle Jerry. It wasn’t a cliché. It was just his personality. "His laughter, with his chest heaving up and down, with a huge smile on his face – that was uncle Jerry. And that bowtie. That bowtie that you know made people smile, you know made his patients more at ease." Jerry Rabinowitz, a primary care physician, was one of 11 people killed in the shooting at Tree of Life synagogue on Saturday. Artist behind revamped Steelers logo: “I wanted it to be of resiliency and hope." Tim Hindes sat down shortly after the shooting and began to doodle a revamped Pittsburgh Steelers logo, with the Star of David substituting for the team's yellow star-like design. It's paired with the phrase "Stronger than Hate." The image has quickly become a symbol of solidarity and strength after the deadly attack. Hindes said he was inspired by the shooting and by a friend being the victim of anti-Semitic comments a few days ago. In a Facebook post, Hindes explained what the symbol meant to him. “Before it was the logo of a globally popular football team, the three diamonds were the seal of a product which helped develop the foundation of many cities across the globe -- steel. Like Pittsburgh and its residents, steel is strong,” he posted to Facebook. Hindes said he doesn’t want credit or accolades for the picture. "Use it. Share it. This is an image for Pittsburgh and those who love Pittsburgh," he said. Shay Khatiri woke up on his Jewish friend's couch to the devastating news. A mass shooting at a Pittsburgh synagogue had left 11 people dead and several others injured. "She told me what happened and she was just broken," Khatiri told CNN. "Seeing how upset she was, I wanted to donate to the congregation." But Khatiri, a 29-year-old Iranian immigrant and graduate student in Washington, DC, didn't have much to give. "I thought to myself, I could donate $18 or $36 -- something like that. But that wouldn't make a huge impact," he said. "If I did something like this, maybe it could go viral and have a huge impact," he added. By "this," he meant “start a GoFundMe campaign.” So far, it’s raised more than $300,000. Investigators have finished their search of the shooting suspect's car, according to an FBI spokeswoman. FBI Pittsburgh Special Agent in Charge Bob Jones had said at a news conference Sunday morning that authorities were planning to search the vehicle, and that they had already searched Robert Bowers' house in Baldwin Saturday. Investigators continue Sunday afternoon to search for surveillance video that could be helpful in piecing together the moments before and during the attack, the spokeswoman said. On Sunday morning, Jones did not say that investigators had recovered any video. "We're attempting to see if there were surveillance cameras in position where we could capture footage, but we’ll look at the neighborhood and try to find everything we can," he said. FBI evidence response teams from multiple field offices are continuing to work at the synagogue. Jones described it as a "large, complex crime scene" that could take up to a week to process. The FBI would not discuss anything recovered from the search warrants executed at Bowers' home or vehicle. A robot took part in last night’s federal law enforcement search at the last known address of synagogue shooting suspect Robert Bowers. 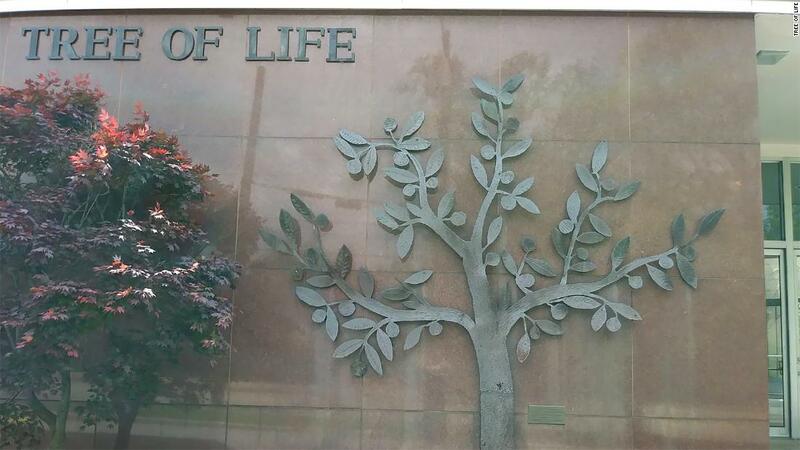 Shannon Haldeman of the local non-profit organization Scent with Love delivered flowers to the Tree of Life synagogue on Sunday and took a photo of the growing memorial outside the site of the shooting. Haldeman told CNN that Scent with Love picks up flowers from wedding and events and delivers them to places in need around Pittsburgh. “These arrangements were picked up from two different weddings last evening by myself and my volunteers and we delivered them this morning,” Haldeman said. 97-year-old victim "had a lot of years left"
Rose Mallinger may have been 97 years old, but she was still "spry" and "vibrant," said Tree of Life member Robin Friedman. "She had a lot of years left," Friedman told CNN. Mallinger was the oldest victim in the shooting at Tree of Life synagogue in Pittsburgh on Saturday. She had been a secretary at the synagogue's school office decades ago, and she regularly attended Tree of Life services with her daughter. "She was just the sweetest. A lovely lady," Friedman said. "She had to know everybody there, (whether) old, young. Always a hello, always a hug, always a smile." Friedman also said that Cecil and David Rosenthal were a constant presence at the Tree of Life synagogue. "They lived and died there. They came to everything. Sports nights, annual meetings. They were always there in suit and tie," she said. "They won multiple awards and citations for their devotion, for their generosity of their time, for their volunteerism, anything you asked them to do."